Originally published by the author, 1943, Cambridge, Ohio. This is an 1978 reprint by Unigraphic, Inc. Covers show very light wear. Inside pages are very nice and clean. A small number of pages have some underlining. 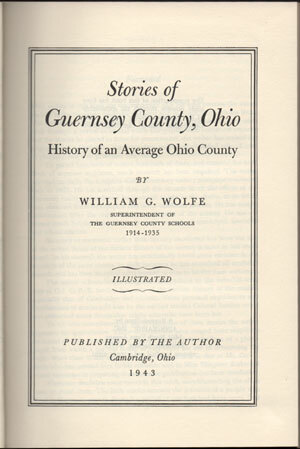 A detailed history of Guernsey County, Ohio from first settlement and continuing to the 1940's. Although are large number of names are mentioned, this volume does not include many biographies. An every name index includes 71 pages of names in three columns. Hard cover, thick volume of 1,093 pages with an additional 71 pages of indexed names.